One of the most expensive Speed Camera Detector / Warning devices, the Origin B2 promises much in a very small package, and it had better deliver at this price! I didn't have the Origin B2 for a full test, it was in someones car who I was going to a meeting with, but I persuaded him to take some detours past speed-cameras so I could see it in action! The Origin B2 is very small, and my colleague had the main unit stuck in the bottom right of his windscreen, with the laser module stuck in front of the rear view mirror mount. 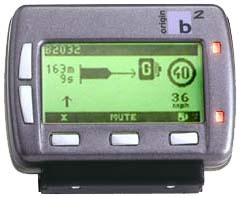 The Origin B2 holds in its memory the locations of all fixed postion, mobile, temporary speed cameras, and accident black-spots and schools. The laser module should also alert you to mobile units that aren't on its maps. This Speed Camera Warning device impressed me with the warnings given when approaching Gatsos and Truvelos - loud beeps and a voice telling you the type of camera you are approaching and the speed limit, the voice is a little quiet, but the warning works. I interrogated my colleague about his experiences with the Origin B2 over the last 2 months, and he was very impressed, it had picked up every camera he had ever passed, and he had been warned by the laser detector twice, although he never saw the van or copper who was targetting him. So, its difficult to for me to make a firm conclusion about the Origin B2 Speed Camera warning device - I couldn't test it for long enough, but my colleauge, who has 6 points on his license, said it was the best £350 he had ever spent. I think thats recommendation enough!